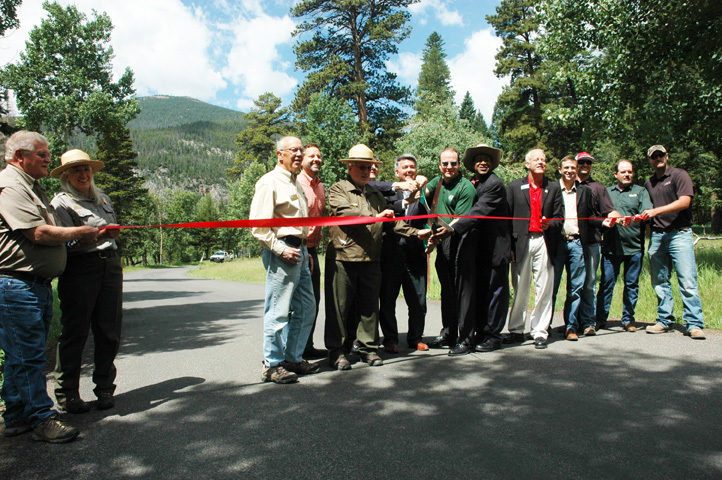 ESTES PARK – On July 2 at 11:00 a.m., Senator Cory Gardner, Congressman Jared Polis and Federal Highways Administration Division Director Ric Suarez joined park superintendent Vaughn Baker to open Old Fall River Road for the season. In September of 2013, Rocky Mountain National Park received a record amount of rainfall. Damage in the park was wide spread on the east side of the Continental Divide. Damage was extensive on Old Fall River Road and the Alluvial Fan area. The road was closed to vehicles after the flood in 2013 and during the summer of 2014. The opening of Old Fall River Road is a significant milestone in the recovery of the flood of 2013. The Federal Highways Administration funded this $4 million project through the Emergency Relief for Federally Owned Roads (ERFO) program. Old Fall River Road is a historic dirt road built between 1913 and 1920. Due to the winding, narrow nature of the road, the scenic 9.4-mile route is one-way. It follows the steep slope of Mount Chapin’s south face. Normally the road is open from the fourth of July to early October. Tags: Estes Park, Flood Recovery, Old Fall River Road, Rocky Mountain National Park. Bookmark the permalink.